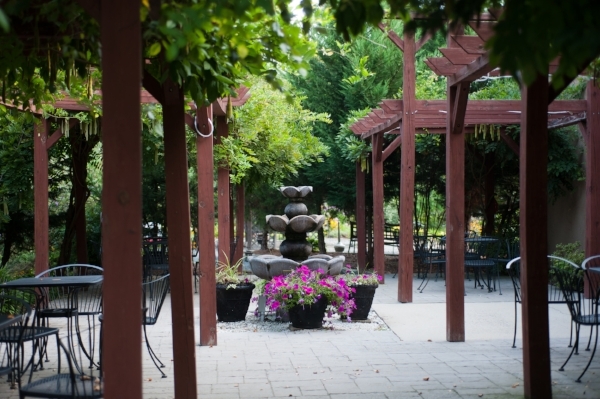 Lost Creek offers several unique spaces for your private event including rehearsal dinners, bridal showers, wedding anniversaries, birthday parties and more! We have spaces available to accommodate any size ranging from an intimate 10 person celebration to a larger gathering up to 175 people. Our spaces include indoor and outdoor venues at both The Winery and The Harvest House. Looking for a beautiful outdoor option during warmer months? Our beautiful garden patio is a perfect option for dining. Our Tasting Room features a full size tasting bar, fireplace, tables and chairs and lounge furniture. Perfect for an evening. The Harvest House is a great space for smaller & larger gatherings. It is versatile offering indoor & outdoor options featuring a fireplace, wooden floors and an expansive stone terrace. The Carriage House is our largest private space and can be configured in multiple formats to meet your private event needs. This space can accommodate up to 175 people with a dance floor. We have packages to fit any size and occasion including bridal showers, birthday & retirement parties, holiday celebrations & more! We are happy to customize your experience. Perfect for mingling with guests before enjoying a buffet or a seated luncheon or dinner. Looking for a cocktail style event? We can accommodate that too with our array of bar packages, passed hors d'oeuvres & display options.. The Tasting Salon is a perfect way to enjoy an educational tasting of 6 Lost Creek wines while talking with friends & family. We provide three tasting stations each with a wine educator pouring & explaining wines for your guests. Ask about our food pairing options to go with each wine! Our seasonal buffet offer some great options for a luncheon or dinner. Featuring a choice of a salad, side and dessert this is a perfect relaxing option. Looking for an afternoon with friends to celebrate! Our luncheon is perfect for bridal showers, engagement parties & more! Featuring 2 or 3 course options. A more formal occasion or celebration. Our 3 or 5 course plated dinner is a beautiful option. Add a Lost Creek wine to pair with each course and its perfect! We have some great additional upgrades to make your afternoon or evening perfect including an array of platter display options, full service bar packages with an assortment of wine, beer & liquor and seated wine tastings.